Chinese New Year arrangements for sale. Red, gold yellow and orange are all "lucky" colours for CNY. These are what I knew as "five-fingered eggplants" (they are poisonous), the genus name of the plant is solanum mammosum. The wikipedia link below will tell you some of its common names I didn't know until now ( amusing certain members of my family). 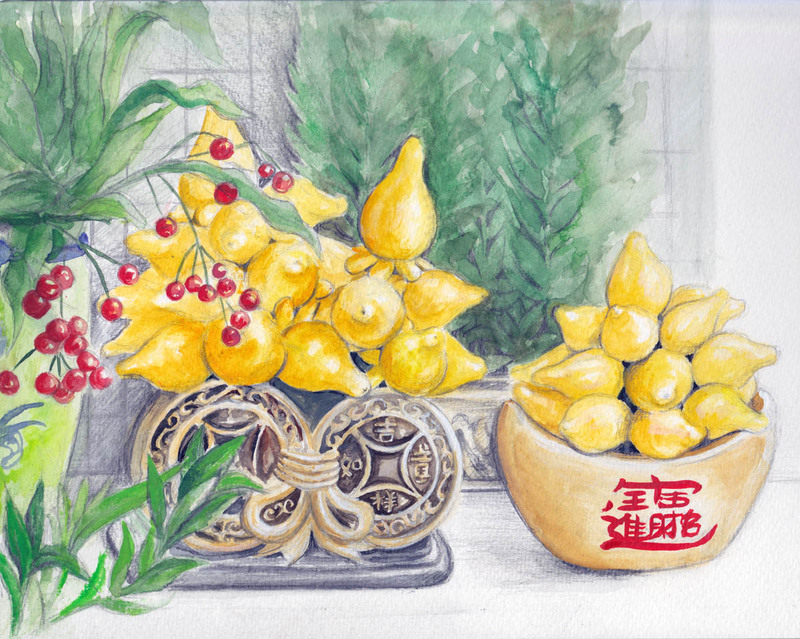 I do envy you the glorious range of exotic fruits you have the opportunity to draw. These look quite strange with their 'fingers'! I love the yellows against the violetty blue greys - great drawing/painting. What an interesting plant and a wonderful little painting! Interesting sketch and very well done. Are these used as a decoration? Wow, those are something else! I love the drawing - such vibrant colors! Lovely illustration Debra, I like the details in the red berries and plant holder. These yellow plants are an interesting shape. Fabulous! The yellow really comes out. Great use of detail in the foreground with less detail in the background. This is really great! I love how the bright yellow of the lemons and the red of the berries and the calligraphy really make it eye-catching! Awesome work! I always see the most amazing things when I come to your blog! I have never seen, or even heard of these! Wonderful sketches; and I had a look at your wikipedia link...too funny! It made me smile too, because of course now I had to look it up although I had an inkling. The yellow with the red accents are lovely. Do they have large seeds? I would imagine something like that of a tomato. Keep us smiling! I always look at your stellar work! I rarely comment but of course that is merely a time issue. I think you have a marvelous style and aesthetic. This post is no exception- well executed, beautiful colors and a great back story! Thanks for your recent comment on my blog and for following along. Beautiful sketch! Love those colors!